NEW AUTOMATIC SIGNALS govern the Southern Railway’s Main Up Line between Balcombe Tunnel and Three Bridges in Sussex. How they work is explained below. 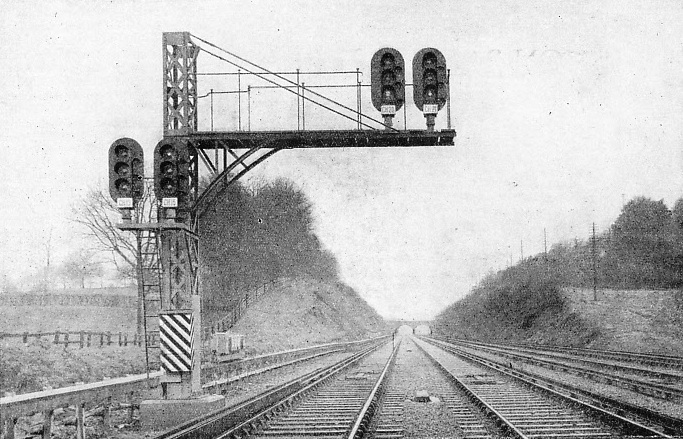 THE first railway signals were used entirely as a protective measure. Safety was their sole purpose, and all that was required of a signal was to indicate cither “Danger - Stop!” Or “All Clear - Proceed!” The modern conception of signalling is different. Safety remains its primary object, of course, but the signalling system of to-day does far more than distinguish between danger and safety; it informs the engine-driver not only whether he may proceed, but also at what speed he may travel safely. This introduction of a time element is vitally important to-day. Under modern conditions the swift movement of traffic over the whole route constitutes a major problem for the railway engineer. To solve this problem signals and signalling systems are constantly being improved along our railway lines. New conditions demand new ideas and new apparatus, all of great importance to the traveller, though often unnoticed by him. The necessity for greater safety, the increase in numbers of trains to be handled, the operation of faster services, are vital things which call imperatively for corresponding improvements in the instructions given to the engine-driver. As the modern train pulls out on its closely-scheduled run it is surrounded and safeguarded by the fast and flexible intelligence system evolved by the signal engineers. Ahead of the train the way must be cleared; behind it the line must be closed; and throughout its journey it must be accompanied by a swiftly-moving system of protective signalling. The familiar semaphore arms, the coloured lights - these are but momentary evidence of the complete and continuous system of communications that protect and control the train as it passes from section to section. To govern speed as well as to indicate safety is the function of modern signalling. The simple semaphore signal, so well known to all travellers, has given place to a complicated system of grouped signals on all the busier lines. It is a system which mystifies the public, but which gives clear and definite instructions to the engine driver. Instead of having only two positions - horizontal or at an angle of sixty degrees - the semaphore arm can be used as a three-position signal. In its horizontal position it indicates “Danger”; at an angle of forty-five degrees “Caution”; and in the vertical position, “Clear”. Perhaps the most striking development is the use of colour-light signals. These are a complete departure from the semaphore-arm system, over which it is claimed they have many advantages. For example, the same indications are used for night as for day working, and, they are so compact that the colour-light signals can be placed in the best indicating positions on the track itself. Focused into a beam, their powerful illumination is visible to the engine-driver over long distances, even in bright sunlight. And the system has much more to commend it in bad weather, when fog or mist make good signalling particularly difficult. Colour-light signalling, as the name implies, depends primarily upon the use of the difference in colours - red for danger, yellow for caution, and green for clear. It is, however, possible to extend the indications by using more than one light at a time. Suppose, for example, two yellow lights can be used, as well as the red and green. This gives what is known as a four-aspect signal. The advantage of such a multi-aspect signal is that it can give the engine-driver advance information about the next two signals ahead, so that train-speed can be adjusted in anticipation of their indication. Such a signalling system, by increasing the information conveyed to the engine-driver has obvious advantages on lines which must carry a large number of trains in quick succession. In fact, this “multi-aspect” system, as it is called, gives a very valuable flexibility when compared with that of older and simpler systems. By warning the engine-driver of coming eventualities it enables him to get, as it were, a lengthened view of the line ahead. Alteration to the signal itself is only one of the problems of improved signalling. We have dealt, so far, only with the message conveyed to the driver of the train; an equally important consideration is the means by which the signal is linked to the cabin from which it is operated. Very long levers and rods were invariably used at one time These were operated by the signalman, and called for consider-able muscular effort on his part, especially with distant signals. But nowadays the signalman often controls a source of power, usually electricity or compressed air, which does the work This is known as power signalling. There are many important advantages derived from such a method, in addition to that of lightening the labours of the signalman It is possible, for example, to work signals placed at much greater distances from the signal-box than when manual operation is employed. This is very important, since the tendency in all modern signalling is to increase the degree of train control by placing more and more signals along the lines. To operate all these by man-power would mean a multiplicity of signal-boxes, placed at relatively short intervals from each other; but power signalling can operate over greater distances, thus enabling fewer signal-boxes to be used and the overall cost of operation to be reduced. These advantages apply with even greater force to the moving of points by the signalman, which is necessary whenever a train is to move from one set of metals to another. However close to the points the signal cabin is placed, the change-over will entail considerable physical strength to shift the control lever, and there is a definite limit set to the distance over which such man-operated points can be controlled. The Ministry of Transport decrees a maximum of 350 yards for points that are manually operated. Power signalling does away with this difficulty of exerting a considerable force at a distance, since the power unit can, if necessary, be located quite close to the points; and all that the signalman need do then is to control that power, instead of transmitting it over a distance. THE OLD AND THE NEW SYSTEMS. This view of Brighton station shows the semaphore-arm signals which were formerly in use. Compare it with the view below, which depicts the new colour-light signals that now control the same lines. There are. Indeed, it is in this field that the magic of modern signalling is fully shown; for although all improved methods tend directly towards greater safety, probably the most strikingly ingenious and effective inventions have centred round the prevention of accident. The fundamental signalling safeguard, which was evolved in the early days and is still effective, is the block system, by which only one passenger train at a time runs on a given section of the line. If this safeguard can be definitely assured, collision is impossible. It is in the methods taken to achieve this end that modern signalling has worked wonders. 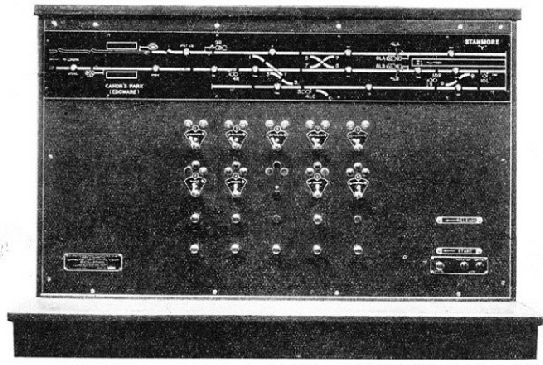 One of the first steps towards accident-proof signalling was the introduction of interlocking, connecting certain signals and points together in such a way that it became impossible to make mistakes which might otherwise have occurred. This was first done mechanically, by the use of special interlocking apparatus so designed that it became impossible to pull one lever until its counterpart was in the correct position for the desired operation. For example, when distant and home signals were interlocked, it became impossible for the distant signal to fall into the “home-signal-is-clear” position, unless the home signal actually was indicating “clear”. In other words, mechanical interlocking provides that control levers which should work in conjunction with each other are so constructed that they automatically check their own operation, and cannot, therefore, be made to work except in the predetermined and correct sequence. Similarly, to prevent vehicles from moving inadvertently from a siding or yard on to a passenger line, safety points, which divert runaway wagons, came into operation in conjunction with the main line signals. On this principle of the interdependence of one moving part on another a comprehensive safety system has come into being. By its means a continuous check is established, safeguarding every movement, and ensuring that certain necessary conditions must be fulfilled in their correct order before the corresponding indication is given. To take a simple instance, suppose that a train on a main line has to leave this for a branch line at a certain part of its journey. As the engine approaches the junction the driver sees that the signal for the branch line is “clear”; and on an interlocked system he is then certain that the points must be correctly set for the change-over, because these are worked in conjunction with the signal-operating mechanism. He knows that until the points are correctly in place it is literally impossible for the signalman to move the branch signal from “danger” to “clear”; so the driver proceeds with confidence because the apparatus itself automatically checks the change-over mechanism, and ensures a clear road. By ingenuity and skilful design, the signal-engineer has provided similar safeguards for a multitude of contingencies, against which protection is required In this he is greatly aided by the fact that the use of electricity on the railways is now being widely extended. As an aid to signalling, it has many outstanding advantages, not the least of which is that it can be installed in such a way that in the (very unlikely) event of breakdown it will always “play for safety” by automatically registering “danger”. And thus the worst that can happen as a result of electrical failure is delay of traffic owing to signals registering danger until the fault has been repaired. One good example of the uses of electricity in signalling is the system of electrical repeaters; these check the indications given by signals that are out of sight of the signalman. Beside the lever which he operates is placed an indicator that is worked by an electrical circuit of which the distant signal arm is an essential part. If he moves the lever to the “Clear” position, the electrical indicator, or repeater, will immediately change to “Clear” also, provided that the signal arm has actually responded as desired. The repeater is worked through electrical contacts which are placed on the signal itself, so that the repeater is an instant and definite check on the out-of-sight mechanism. ADVANTAGES OF COLOUR-LIGHT SIGNALLING. The new signals are not only easier to distinguish, but also give the same indications by day as by night - a great advantage in practice. Above each cluster shown is a route indicator. Should the signal arm’s response be incomplete, or unsatisfactory, the repeater will at once call attention to this by indicating “wrong”, and thus it will warn the signalman of the failure. A variation of this method is extensively used to make sure that an oil signal-lamp which is out of sight of the signalman does not go out unnoticed. The heat of the lamp is made to expand a special metal rod, placed near the flame, which then, by means of an electrical circuit, indicates “on” to the signal-box. If, for any reason, the lamp should go out, the rod gets cool, which will alter the indication to the signal-box and warn the signalman. An effective method of checking the indications given by a colour-light signal, and repeating them to the signal-box, consists in lighting the repeater lamp from current obtainable from that actually flowing through the signal-lamp. So if the signal-lamp is not burning there is no current available for the repeater, and its failure is apparent in the cabin. Ingenious electrical devices are always watching to overcome the possibility of errors arising through accident or failure. The immediate effect of such devices is to check the signalman’s work at every stage, protecting him from all avoidable errors, and relieving him of the physical effort necessitated by the operation of manual levers. Obviously the whole tendency is to promote safety, and a secondary advantage is that the traffic can be handled much more quickly and economically. WORKED FROM A SIGNAL BOX 4 MILES AWAY. These remarkably interesting electric signals at Stanmore are worked from Wembley Park, 4 miles away, a distance that would have been prohibitive with a manually operated system. The Wembley Control Panel is illustrated below. One very striking feature of this installation is that the whole of the control of the signals and points shown by the diagram at the top of the panel is carried out over three live wires between Stanmore and Wembley Park. The casing near the line in the foreground houses a special stop mechanism which will automatically put on the brakes of any train attempting to pass the signal at “danger”. All the foregoing developments in signalling are based on a system in which the control is in the hands of the signalman. But there is one method where a fundamental departure in practice is made, and the trains themselves actually operate the signals. This is known as automatic signalling, and the advantages claimed from its use are many and varied. They include the replacement of the human factor by tireless machinery; the lower running costs owing to the reduced wages bill; the greater speed of the automatic response, thus saving valuable time; and the economy effected by working the existing track to its maximum capacity. IT SHOWS TRAINS UPON THE TRACK. This Control Panel at Wembley Park operates the points and signals at Stanmore and shows by means of little lamps the movements of all trains between that station and Edgware. This installation was the first of its kind in Europe, and it has successfully demonstrated under practical working conditions how small thumb-switches can be used instead of the usual long levers operated by the signalman. Automatic signalling is operated electrically, the rails themselves being used as conductors along which the necessary operating current flows. In a section of railway line which is automatically signalled the battery or other source of electrical power is at one end of the section, and the apparatus which it works is at the other end, the two sets of metals between acting as long leads to convey the current to and from the battery. It follows that where one rail in a section ends and the next begins a connecting joint becomes necessary, and this is the reason that one finds stout wires joining one rail to the next on railways employing such systems. It also follows that the insulation (electrical isolation) of one set of rails from another is of great importance. THE SIGNAL STOPS THE TRAIN. This device will automatically put on the brakes of a train attempting to pass a signal at “Danger”. 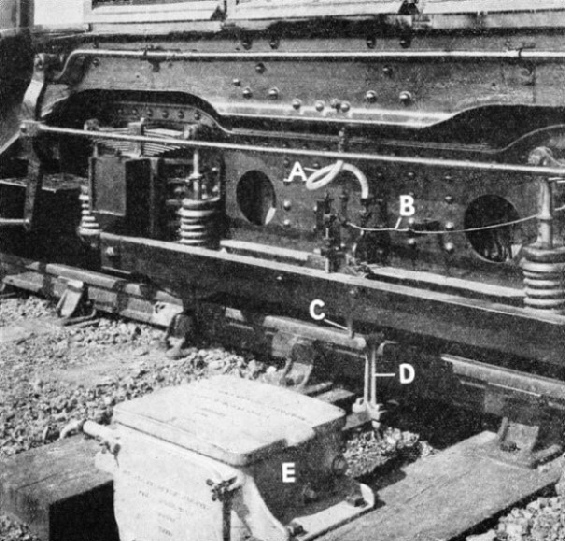 On the power bogie of the train a pipe (A) is attached to the Air Brake, its inlet being opened by the trip lever (C), on coming into contact with the ground arm (D). The control box (E) moves the arm (D) in or out of reach of the trip lever in accordance with the signal indication. At (B) is shown a control wire for closing the air inlet to release the brake when the signal gives “all clear”. If the pair of long lines comprising a section is regarded as a pair of long battery leads, it becomes easy to see how a train can be made to control a signal. 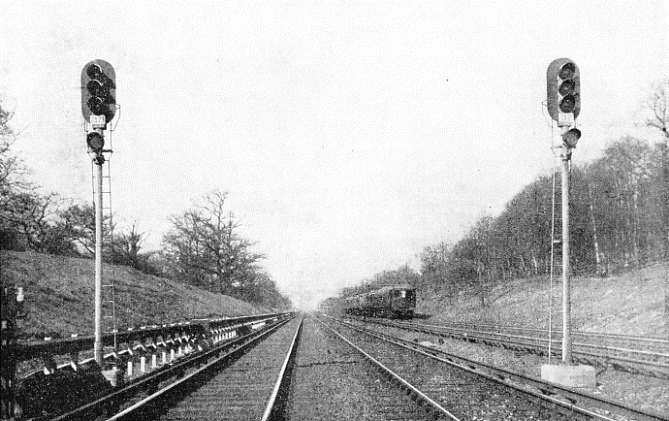 The moment a train enters on a section, it joins the right-hand rail to the left-hand rail through its conductive wheels and axles, and current from the battery, which formerly passed right along one line and back by the other, will now pass from rail to rail through the train itself, in preference to making the longer journey to the apparatus at the far end of the section. Thus the mere presence of the train on the line instantly affects the apparatus ahead, which can be made to signal to succeeding trains “Danger - Stop”. But when the travelling train has left that section in which it made the signal, it allows the battery current to flow again into the apparatus through which it had previously signalled it's presence. And thus the apparatus is made to give a new signal, such as “Caution”, to a following train. By inter-connecting sections to signals, in various ways, it is possible for the moving train to keep a Danger signal always behind it, for protection against following trains, and to release the signal or alter the indication when it gets far enough away to make it safe for the next train to follow. Any points over which it travels are automatically at the right position, being interlocked with the signals, so that when the driver obeys the signals perfect safety is automatically achieved. ELECTRICALLY OPERATED POINTS. The transfer of trains from one set of rails to another is now accomplished by points worked by electric motors, enclosed in steel boxes such as that shown at (F) in this picture. Two sets of points are worked from one machine through the lever (K). 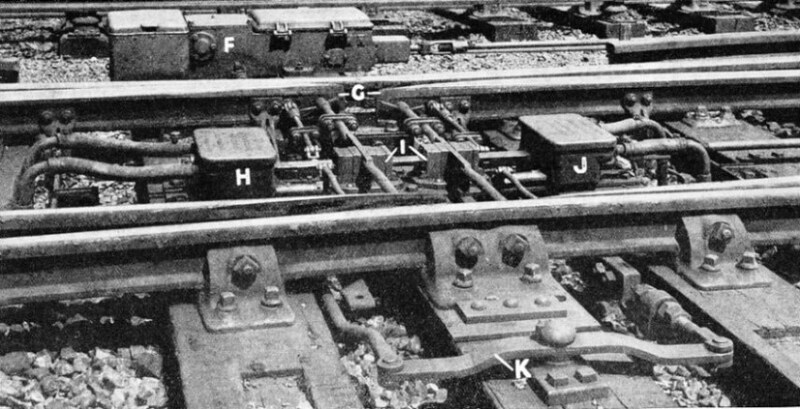 The correct positions of the switch tongues (G) are ensured by the detectors (I) which cause electric contacts to be made in the boxes (H) and (J), these working in conjunction with the signal lights. Thus the points must be correctly set before signal permission can be given for a train to proceed. There is, however, yet another safeguard which can be embodied, and one that is almost human in its ingenuity. This is the automatic train control, which watches to see that the signal’s injunction is obeyed! And if a train enters a section when the signal is at “Stop” the automatic train control instantly and without fail does what the driver should have done - applies the brakes and brings the train to a standstill! The method employed is the familiar one of interlocked apparatus, the two sets of mechanism in question being the “danger” signal itself, and a special check apparatus, mounted inconspicuously beside the adjacent rails. On all the loco-motives which use the system there is a brake-control, mounted low down beside the wheels, and in such a position that it is easily worked by the special check apparatus placed on the permanent way near the signal. When the signal is not at Danger, the check apparatus on the ground remains inoperative, allowing trains to pass without interference. But when the signal is in the “Danger” position the moving arm of the apparatus moves to a position where it will touch a special projection on the locomotive, so putting on the brakes of any train attempting to pass it. As soon as the signal permits, the mechanical “brakesman” returns to its original position and allows traffic to pass freely. Modern methods have greatly lightened the work of the signalman, miniature levers or even little thumb-switches taking the place of the heavy levers formerly used. On the other hand, modern conditions call for more trains at greater speed, and thus the demands made by the traffic upon the signalling system tend to increase. The faster running must be controlled by more indications to the engine-driver, since earlier braking will be required to bring the train to a stop at a given point; and, obviously, such factors as the gradient of the line at that point must be taken into account. Thus, contrary to the general impression, every stretch of railway track presents its own problems to those responsible for the signalling there, and not only must the present conditions be met, but the contingencies of future development must also be borne in mind. The signalman’s duties, which in the past were so largely manual, are now really those of a controller. Instead of the limited outlook of the past, he often has an electrical “map” of whole sections of the line in front of him, with indicators showing the position of the various trains at any moment. Instead of crude levers he has, in his charge, an extraordinarily efficient electromechanical system, flexible in operation, but rigidly interlocked for safety. And the contrast between the limited simplicity of the old style, and the almost unlimited capability of the new, forms a practical example of the amazing changes wrought by the growth of modern signalling. ON THE ELECTRIFIED LINE TO BRIGHTON. Colour-light signalling is employed by the Southern Railway for their electric service to Brighton - the greatest scheme of its kind in the world. 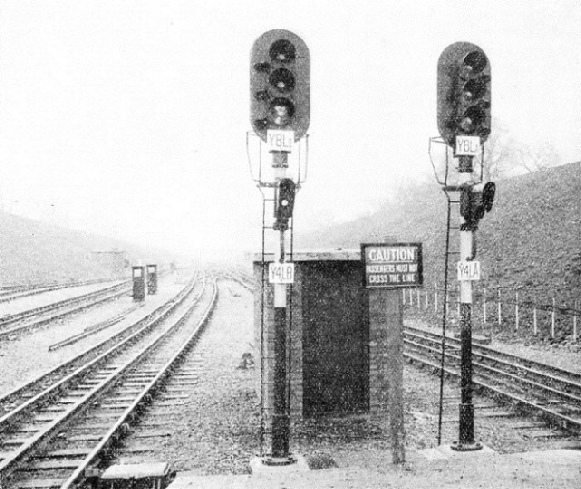 These are the Up Home signals, at Copyhold Junction, Sussex. The striped box on the signal post contains a telephone which can be used by the train-driver or motorman to get into touch with the signalman. The lamps used in the signals are of a special double filament type, to minimize delays which might arise from a burn-out. You can read more on “Automatic Safety” and “Ruling the Traffic Routes” in Railway Wonders of the World.